Though unable to earn a playoff berth with a win, the Dallas Cowboys still managed to put together a winning effort on the road against the Philadelphia Eagles in their season finale. With both teams locked at 0-0 in the fourth quarter, Cowboys quarterback Dak Prescott completed a 20-yard touchdown strike to wide receiver Brice Butler to pull ahead 6-0 with 12:14 left in regulation. Standing in for current starter Nick Foles, Eagles quarterback Nate Sudfeld was unable to match Prescott’s lone score despite completing 18-of-22 passes (81.8 percent) for 116 yards. As previously mentioned, Dallas will be on the outside looking in this postseason even with the win, while the Eagles still lay claim to the No. 1 spot in the NFC. With that, we give you our PFF-exclusive takeaways from the contest for each team. Martin is more than capable of dominant performances facing the league’s best, let alone against backups in a meaningless Week 17 game. It speaks to his mentality and professionalism that he put together such a complete performance. He bullied the Eagles’ reserve defensive tackles and linebackers en route to a 93.7 run-block grade. He also recorded a perfect game in pass protection, seamlessly passing off stunts and weighing anchor against attempted bull rushes. Despite such dominance, this outing ranks only third among Martin’s best games of the season, highlighting the extent of his talent. The left side of Dallas’ offensive line contrasted significantly with the performance of the right. Bell lined up against the only Eagles starter on the defensive line, but he toiled snap after snap. In total, he gave up a hit and five hurries, in addition to three holding penalties. His performance was a little better in the run game, where he was beaten clean on a number of occasions only for Vinny Curry to miss tackles in the backfield. A lack of depth up front is a problem for the Cowboys going forward. Crawford and DeMarcus Lawrence were the most effective pass-rushers for the Cowboys, totaling seven pressures in limited action. Crawford has had a very productive season, totaling four sacks while generating 33 pressures and recording 20 run stops. Lawrence’s four pressures give him 78 on the season, which is well above his previous career high of 46. Woods was only targeted twice on the day, allowing one catch for 12 yards with a pass breakup. Rookie CB Chidobe Awuzie was also impressive, allowing only two receptions on five targets for 17 yards and recording an interception, leading to a passer rating of 10.0 when throwing his way. The Cowboys young secondary has played well of late and could enter the 2018 season as a formidable unit. 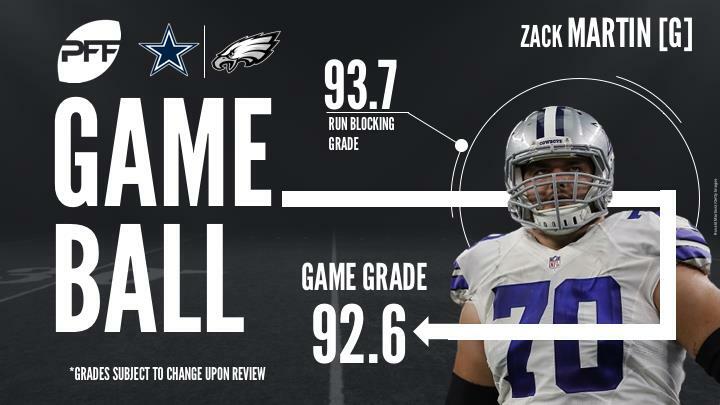 The left side of the Eagles’ starting offensive line played the majority of the game, while the other three saw limited action against the Cowboys. Wisniewski saw 51 total snaps, allowing only two quarterback pressures and finishing with the second-highest run-block grade in the game at 77.4. It was another rough outing the Eagles’ backup signal-caller, as Foles dropped another snap from the shotgun and threw an ugly interception in the second quarter. Foles finished 4-of-11 for only 39 yards before the Eagles made a switch to put in Nate Sudfeld, the second-year man out of Indiana. Sudfeld was able to get the offense in rhythm more effectively than Foles, going 19-of-23 for 134 yards with 17 of those completions being thrown under 10 yards in the air. One of the few defensive players likely to see extensive action in the playoffs to see meaningful action against the Cowboys, Douglas did his case for playing time in the postseason no favors. He missed tackles throughout (two), committed a crucial penalty on third down and gave up a handful of big plays (the longest catch he allowed was for 51 yards). Overall, Douglas gave up seven receptions on 11 targets for 127 yards and a touchdown. Allen looked a cut above the rest of the Eagles’ interior defenders. His extra experience is obviously a major advantage, and he even flashed a couple nice pass-rush moves. Selected to play nose tackle in a two-gap scheme, Allen was expected to depart with the arrival of the new coaching staff. Instead, he’s adapted his game, becoming more explosive to fit the penetrating style. Allen produced a beautiful hump move on one pass-rush snap, illustrating impressive conversion of speed to power. He’ll see important snaps in the postseason because Schwartz believes in rotating up front.